Whenever one encounters a new culture, one of the things that they will notice rather quickly is the emergence of conflict. Commonly when traveling for example, foreigners will unknowingly violate social norms of behavior that might lead to embarrassing situations (such as using one's right hand to eat and greet in Islamic cultures, as the left hand is considered "unclean) while their hosts are left in a quandary - upholding their own cultural norms while still attempting to help the naive traveler save face so they are comfortable in the new environment. This is a coarse example, but it is the core of Face Negotiation Theory. Developed by Stella Ting-Toomey, the theory "explains the culture-based and situational factors that shape communicators' tendencies in approaching and managing conflicts." When we say we are negotiating face, we mean to suggest that we are trying to balance the way in which others see us as well as the manner in which we behave in response to how we see others. Understood this way, we can break down different types of face that Ting-Toomey labels (a) self-face concern, or the protective concern for one's own identity image when one's own face is threatened, (b) other-face concern, or the concern for accommodating the other conflict party's identity image, and (c) mutual-face concern, or the concern for both parties' identity image. Not exactly...but good try, Dustin! The theory argues that different individuals - and really, different cultures - place differential weights on self-, other-, or mutual-face concerns, and these sensitivities can have dire influences on the interpersonal communication process. For example, Oetzel and Ting-Toomey (2003) find that comparing individualistic and collectivistic cultures revealed stark differences in face sensitivity, with more collectivist cultures such as China engaging on more other-face concern and vice versa. Applying this more to our SPICE program, the same study even found some differences between Germany and other countries, with Germans reporting more direct-confrontational facework strategies (i.e., showing little other-face concern) overall. Of course it is the case that other individual and situational factors can play a role in this process (STUDENTS: Can you think of some of these?) but there is no doubt that one's cultural identity plays a major role in the relative important they place on self-, other-, or mutual-face. I can think of an example of this process playing itself out a few days ago, when I was paying for drinks in a German bar. It is common knowledge (at least, I found out later) that in Germany, tips left for drink service are usually much smaller - sometimes no more than €1 or 2 at most. This is because unlike in the US, German bartenders and waiters are paid a 'normal' wage and thus do not rely on tips for their salary (for those who don't know, most US service staff are paid about 1/2 of minimum wage with the assumption that they will make the remainder of their wages of tips). Yet in the US it is a self-face maintenance behavior to leave a decent-to-large tip particularly on a date or with friends, perhaps because we want to appear to be generous. So despite my knowledge of the German customs associated with tipping, I left a bartender a €4,80 top for a €15,20 drink bill (for the record, three glasses of Riesling, a delicious German variant of weisswein indeed!) in an effort to present a positive self-face. However, the move could have been easily viewed as a threat to the bartender's face (other-face) as it might have suggested that I felt he was in need of the money; in fact, it could have possibly been seen as a negative self-face move as I might have appeared to my friends (and really, others in the bar) as arrogant. Ting-Toomey, S. (2009). 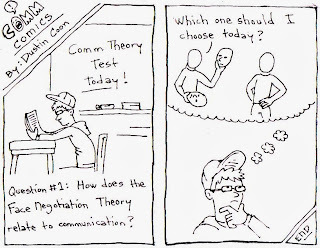 Face Negotiation Theory. Encyclopedia of Communication Theory. Thousand Oaks, CA: SAGE. 372-375.